Nuheart for dogs is a cheaper heartworm prevention tablet. It uses Ivermectin, which is the same ingredient used in Heartgard. 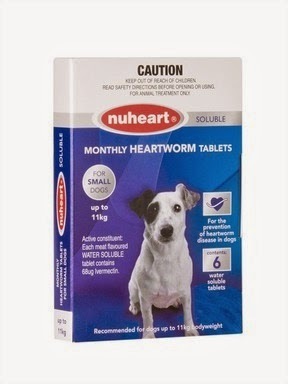 Nuheart monthly heartworm tablet comes in three sizes for small dogs, medium dogs and large dogs. For more information or to buy Nuheart go here. Bradfield's have a new product out call GlycoOmega-Plus for pain, joint and mobility support in dogs, cats, horses and other pets. It contains Glucosamines, Chondroitin-sulphate, Calcium, Phosphorus, Potassium and Vitamin B12. The ingredients include Green-lip Mussel, Fish Cartilage, & Abalone Powder. You can also find more joint and mobility support medications here Paw by Blackmores. For more information at Bradfield's GlycoOmega-Plus.